Nayer's newest line, Enchanted Creek, depicts the beauty of Nature from an aerial perspective, much as a bird would see the Earth as it flies above. 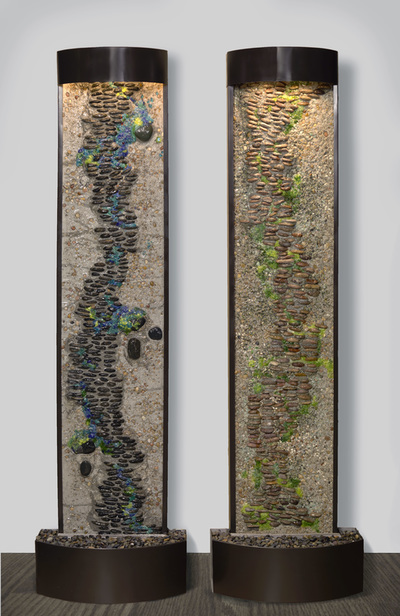 Inspired by countless camping and hiking trips into the heart of the Sierras, Nayer was drawn to sit by rivers and creeks admiring the flow and impact of each on the surroundings. Those images were imprinted on her very Being. Nayer brings the creeks and the rivers of her memories to life in one-of-a-kind, hand-crafted pieces fashioned from natural stone and vibrant glass which capture the very essence and Spirit of Nature.